Somehow the soft knock at my bedroom door wakes me up quicker than the melodic tone of my 8 a.m. phone alarm. Elijah, who woke up in the bedroom next to mine two minutes prior to knocking, steps through the door. He grabs me a pair of sweatpants and a t­-shirt, helps me sit up in my chair, and puts my glasses on. He’s been with me for five years. The morning routine comes as natural as waking up. ”Good morning.” I croak at Mike, my other housemate, who is already hard at work at the dining room table. I’m on the hunt for coffee. Early April rain taps the window. One glance outside and I can tell Syracuse will be cold and dreary today. As I check my phone for the usual: Facebook, ESPN, and Gmail; I enjoy a few strawberries and a banana with my coffee. This is always a relaxing part of my day, I reflect on what has to be done in the next 15 hours: a van inspection, a meeting at the Burton Blatt Institute, a workout at the pool, and power soccer. Power soccer will cap off my night. It is my reward for another successful week. It gives me a calming confidence that nothing will be too big of a challenge. With breakfast finished, I make the turn into the elevator in the corner of my bedroom with about a half inch clearance on either side. I must have gotten great sleep the night before because I don’t crush my footplate on my way in. Elijah meets me in the basement where my bathroom is, complete with a bidet and roll-in shower. Elijah shaves my face carefully but in a rhythm that makes me wonder if he was a barber in a past life. He helps me shower and get dressed. I’m out the door and in my van in haste to avoid the last push of winter’s wind. My phone automatically links to my car and starts to play “Nightmares on Wax”, a smooth electronic jazz station on Pandora.. The rain seems to go along with the subtle beat of the music as I drive into Syracuse. I use the drive time to think. It’s such a contrast, getting ready for each day with help from someone and never on my own, to driving myself to work in my own car. Look how far I’ve come. My parents fought to get me in a power chair at age two. They fought to get me on a school bus with my peers in Kindergarten. They made so many phone calls to help me get my van. Look at how far I’ve come. Look at who has helped me get to the point of Independence. Independence I hold with so much pride. It excites me to think of the future, where inclusion and independence for individuals with disabilities are automatic and not something that is fought for. The rest of the day seems to be on par with how it started: no problems with the van, a productive meeting, Soccer is in my crosshairs. I park my Toyota Siena as Ryan does the same with his Dodge Caravan. Ryan is 26, a Syracuse graduate, an engineer at a major research center in Syracuse, and our goalie. Coach Tony, of 22 years, is already parked. He sees us pull in and opens up, his ramp glows neon blue from the LEDs on either side of the modified piece of folded metal that allows us to seamlessly get in and out of our vehicles. Andrew pulls out of Tony’s Caravan first, they have always been inseparable. It is an unlikely pairing between a 22 year old with a 13 year old; but in soccer age, gender, and personal beliefs do not matter – this is why soccer is so attractive to me. It is an all-inclusive sport for those in power chairs who have been excluded from other sports. This point was highlighted in “Changing Sports, Changing Lives”; a documentary produced by Syracuse University faculty and students on the power of adapted sport and inclusive fitness for those with disabilities. I go back to thinking about the future when I see Andrew. Recently, I picked him up to see a movie. We talked about vans, college, girls, and sports. Andrew just assumes that he will be driving, dating, and playing sports. I thought about how time around Ryan, Tony, and I might have helped to shape these plans. Andrew does not have the cloudy thoughts I had at thirteen years old. He has typical anxieties about getting through high school and waiting for a driver’s license. Andrew does not wonder – how can an Independent Life happen? Time with our team gave him a sense of confidence. The experience with Andrew solidified what I always thought soccer had given me, a chance at an independent and productive life. The confidence and independenceI have gained from my parents, peers, and involvement in sports is exactly what I want for Andrew and others on a larger scale. I will continue to work hard so that inclusion and independence become automatic. Peyton Sefick is a twenty three year old recent graduate of Le Moyne College in Syracuse, New York. Peyton is the Project Coordinator of the Fitness Inclusion Network based out of the Burton Blatt Institute at Syracuse University. 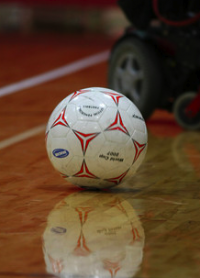 Peyton is anaccomplished power wheelchair soccer athlete. He plays for CNY United in Syracuse, a Premier level soccer club. He was also on the United State National Team which won the World Cup in 2011. Peyton Sefick’s story really speaks to the influence that people can have on us, from our parents to peers to role models. We never know how one word or action can shape a person’s confidence, independence, and notions of their future. How lucky Andrew is to have people like Peyton in his life. The article also speaks to the power of inclusive sports and how soccer and any other sport can provide confidence and build a true sense of independence. Peyton’s story is the realization of the benefits that sport can have on a community and a university. I agree with how it also benefits those who are part of his life.